“Happiness is a clean windscreen.” We stared in astonishment at the small card pinned behind our car’s wiper blades. We had just checked out of our hotel in Norfolk, UK and were not looking forward to the long drive ahead of us. 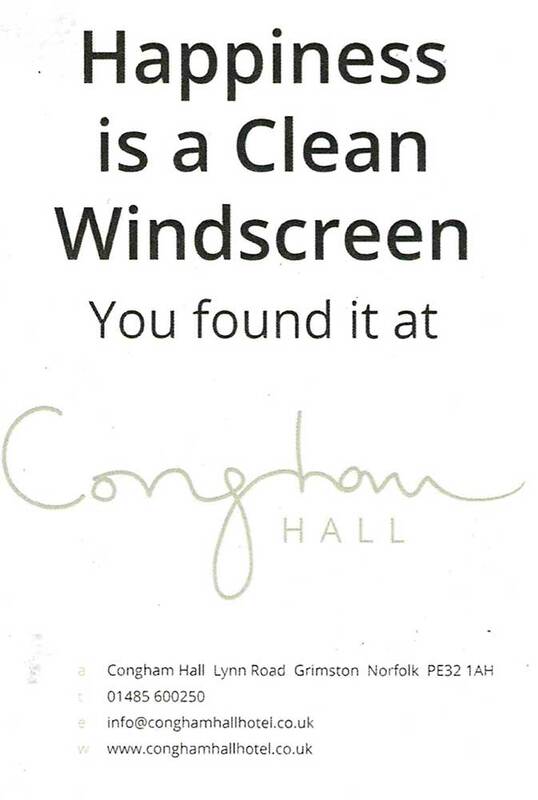 But faced with this random act of kindness – a member of hotel staff had obviously been out first thing to clean our windscreen free of bugs – our mood lightened. I don’t know how many cars receive this preferential treatment each morning, but the hotel hit its mark with us. My husband, you see, has a thing about keeping our car clean. For years he would allocate a couple of hours every Sunday morning to detailing the car inside and out. Then children came along, time became more precious and we rather fell out of the habit of the weekly trip to the local garage singing along to Car Wash with Rose Royce. Ironically, we now need that routine more than ever. If you’ve spent more than a couple of days in Gstaad during the winter you’ll understand the near-impossibility of keeping a car clean here. Yet some handle this better than most. Not long after moving to the region we met a man who, I suspect, had a similar clean-car fetish to my husband. I’ll call this man Michael to protect the innocent. Michael had children at the same school as us, so he also drove the twice-daily school run through snow, slush, mud and salt. Yet despite this his car always looked shiny and immaculate. To make matters worse it wasn’t even silver, but a dark blue-black. How did he achieve such perfection? We never asked, but he was undoubtedly a dab hand with a power washer. Saanenland isn’t badly served for manual car washing. There are plenty of self-service power wash facilities dotted around, but I’m not a fan of them. I don’t mind the actual process of cleaning the car, though I always seem to end up with smears across the paintwork and never have enough change on me to complete the job well. No, I much prefer automatic car wash machines. There was a time when the Tamoil petrol station on the road between Gstaad and Saanen had a drive-through car wash. It was wonderful. A quick detour off the main road and a few minutes later out you’d drive with a spanking-clean car – for a few metres at least. Alas that is no more. Rütti-Garage in Gstaad offers a super car cleaning service, but it’s often very busy and in high season you’re advised to book a slot and leave the car with them. This isn’t always so convenient for us so recently we’ve been heading across to Zweisimmen. Garage Autohaus Zweisimmen has an automatic car wash that’s open 24 hours a day 365 days a year. It’s a quick and easy way to get the job done whenever you happen to be in the mood. But you still need to tackle the car interior. This is another gnarly problem during wintertime. Our last car had rubber floor mats with a kind of chequered square design. Extremely practical in many ways, but over the course of the winter months dirt and salt would well up in corners of the little squares. We’d remove the mats frequently, spray them with a pressure washer then dry them carefully, laboriously - and invariably to no avail. Whatever we did, we never seemed to completely eliminate the salt stains. Yet whenever we sent the car to be serviced a curious thing happened: it came back with pristine charcoal-grey mats. Every single time. Eventually we decided the garage was replacing our mats with new ones. It was the only explanation, although we never saw a charge on the invoice for this. Billing error or not, I prefer to think the new mats, like the Norfolk hotel’s clean windscreens, was the garage simply spreading a little happiness. Not a bad approach to adopt as we enter a new year.